JUVÉDERM VOLBELLA® XC is developed specifically for your lips and mouth area. If you’ve lost the soft, sensual lips you used to have and want a subtle, more kissable look, then JUVÉDERM VOLBELLA® XC is exactly what you’ve been looking for. A smooth gel that is injected using an ultra-fine needle, JUVÉDERM VOLBELLA® XC is the best filler for assuring a soft, natural feel. The gel fills in lip lines and wrinkles while the hyaluronic acid within attracts and retains moisture for incredibly soft lips. The skin on your lips is constantly moisturized from within by hyaluronic acid, a naturally occurring sugar. As your skin loses hyaluronic acid over time, lines begin to appear around the mouth. This loss of hyaluronic acid leads to the appearance of wrinkles and the loss of fullness to your lips. As your lips become thinner, they lose volume and lack definition. Typically, you’ll develop vertical, or “marionette”, lines around the mouth, which can form at the corners going down to the chin or we can even develop a droop to the corners of the mouth, giving your mouth a sad appearance. The smooth consistency of the products in the JUVÉDERM VOLBELLA® XC and VYCROSS™ ranges allow easy and smooth placement. They also contain 0.3% Lidocaine to reduce injection pain for a more comfortable experience. It’s best to stop wearing makeup for up to 12 hours. Dr. Lindahl recommends that you avoid the sun, as well as saunas and steam rooms, for 2 weeks. Some people experience a little temporary tenderness, swelling or bruising around the injection sites. It is also recommended that you avoid additional treatments in the treated area for the next 7 days. The Newest FDA Approved Lip Filler, JUVÉDERM VOLBELLA® XC , is the latest FDA-approved injectable added to the Juvéderm® family of dermal fillers. This non-surgical lip augmentation treatment is designed to plump the lips and minimize the appearance of fine lines around the mouth, also known as perioral rhytids or perioral lines. Perioral lines were previously difficult to treat, so we are excited about this new treatment option for our patients. If you have been looking for a natural-looking and feeling lip filler to enhance lip fullness and reduce lines around the mouth, our practice one of the most cutting-edge, surgery-free, solutions. Volbella is a dermal filler made of Hyaluronic Acid and used to define lips and smooth fine lines and wrinkles around the lips. This temporary filler is made of Hyaluronic Acid and does not require a skin test before your injections. The smaller Hylauronic Acid particle size in Volbella allows your cosmetic injector to treat fine lines without the issue administrators had in the past of the skin appearing thicker in these delicate areas. The smaller particle size allows for the correction of these fine areas without the worry that your lips will get bulky or too puffy. It’s subtle, but remarkable. Volbella, using patented VYCROSS™ technology, has been proven to soften and fill lines in a majority of patients through one year. Since Volbella is also formulated with hyaluronic acid, the skin will retain moisture and softness ensuring long-lasting results. 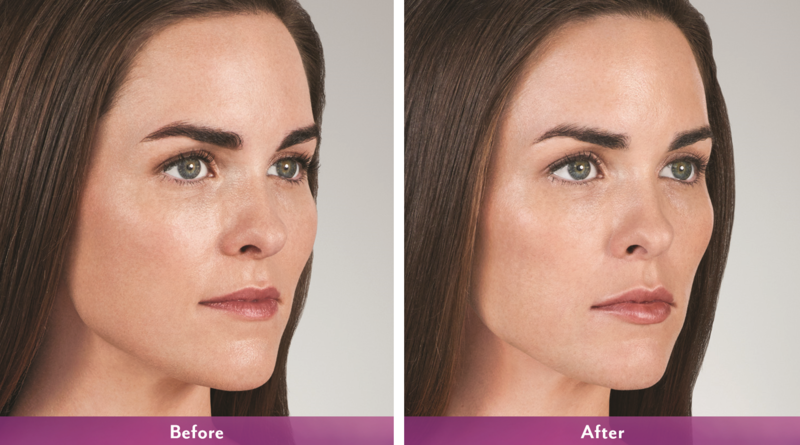 This data from Allergan includes a one month touch up so that optimal correction is achieved. JUVÉDERM VOLBELLA® XC uses VYCROSS™ technology. VYCROSS™ technology is a proprietary filler technology from Allergan, which yields smooth dermal filler products that have been engineered to address specific patient concerns. The most common side effects of JUVÉDERM VOLBELLA® XC are slight swelling, bruising, tenderness, redness, pain, and the possibility of discomfort and itching. These common side effects are temporary responses that can occur at the treatment site. When you call to book your appointment with Dr. Lindahl, please feel free ask about how to avoid any bruising or swelling when having your injections. Recovery with JUVÉDERM VOLBELLA® XC is minimal allowing you to return to your usual activities after the procedure. You may experience mild side effects such as redness, tenderness or swelling right after the procedure, but side effects should subside within a couple weeks. Within the first 24 hours after your treatment, it is best to not do extreme exercise and to limit sun exposure. Lips augmentation and fine line treatments with JUVÉDERM VOLBELLA® XC are relatively painless. Another unique characteristic about JUVÉDERM VOLBELLA® XC is that it is formulated with a small amount of lidocaine. Lidocaine is a local anesthetic designed to reduce pain and maximize comfort during the Volbella procedure. You can expect minimal discomfort while receiving JUVÉDERM VOLBELLA® XC injections. When treating fine lines, we use the smallest needle possible for you injections. This allows for a more comfortable injection experience. Please ask our staff about arriving early for numbing cream or you can also hold ice to the area to numb if you prefer. What makes JUVÉDERM VOLBELLA® XC unique compared to other fillers? JUVÉDERM VOLBELLA® XC is unique because it is the first lip augmentation filler that is FDA approved to address perioral lines, or smoker lines around the mouth. JUVÉDERM VOLBELLA® XC is now the solution for patients who are particularly concerned about the appearance of perioral lines. JUVÉDERM VOLBELLA® XC boasts the filler technology by Allergan called VYCROSS™. Using this technology makes Volbella have a smooth, gel consistency and long-lasting results. This lip filler contains hyaluronic acid allowing for the subtle addition of volume, along with the natural feel and appearance of the lips. What is the difference between JUVÉDERM VOLBELLA® XC , JUVÉDERM VOLUMA® and Volbella? These products, while all made of Hylauronic acid, each have their own unique properties. Each product is approved for specific areas based on their thickness and particle size. Talk to your practitioner about which JUVÉDERM® product is the best to address your concerns. The safety of JUVÉDERM VOLBELLA® XC in patients under 22 years has not been studied. The safety and effectiveness of JUVÉDERM VOLBELLA® XC in areas other than the lips and perioral area have not been established in controlled clinical studies. Tell your doctor if you are on immunosuppressive therapy used to decrease the body’s immune response, as the use of JUVÉDERM VOLBELLA® XC may result in an increased risk of infection. The most common side effects include swelling, tenderness, bruising, firmness, lumps/bumps, redness, pain, discoloration, and itching. Most side effects are mild or moderate and last 30 days or less. One of the risks of using this product is unintentional injection into a blood vessel, and while rare, the complications can be serious and may be permanent. These complications, which have been reported for facial injections, can include vision abnormalities, blindness, stroke, temporary scabs, or permanent scarring. As with all skin injection procedures, there is a risk of infection.